The Right Honourable Dame Elizabeth Butler-Sloss, GBE, was born on 10 August 1933 and educated at Wycombe Abbey School. She is the daughter of the judge Sir Cecil Havers and sister of the late Lord Chancellor, Michael Havers. At the age of 21 Dame Elizabeth was called to the Bar (Inner Temple) and practiced at the Bar from 1955 to 1970. She became a Bencher in 1979 and Treasurer in 1998. She was a Judge of the High Court Family Division between 1979 and 1988 and the first woman appointed Lord Justice of the Court of Appeal, sitting from 1988 to 1999. In 1987 she chaired the Cleveland Child Abuse Inquiry which resulted in the Children Act 1989, incorporating many of her recommendations. Dame Elizabeth was the first woman to hold the position of President of the Family Division from 1999 to 2005 and she was, by then, the highest ranking woman judge in the United Kingdom. Dame Elizabeth has many other titles and responsibilities. She is an Honorary Fellow and Visitor to St Hilda’s College, Oxford; a Fellow of King’s College London; Chairman to the Advisory Council of St Paul’s Cathedral; Chairman to the Commission for the appointment of the Archbishop of Canterbury and President of the Commonwealth & English Bar Association. 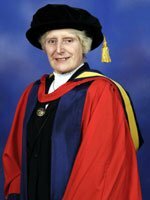 She also holds a number of honorary degrees and has been Chancellor of the University of the West of England since 1993. In 1959 she married Joseph Butler-Sloss and has two sons, one daughter and six grandchildren. Dame Elizabeth was awarded a DBE in 1979; appointed Privy Counsellor in 1988 and was raised to the rank of Dame Grand Cross of the Order of the British Empire in the New Year’s Honours List in December, 2004.